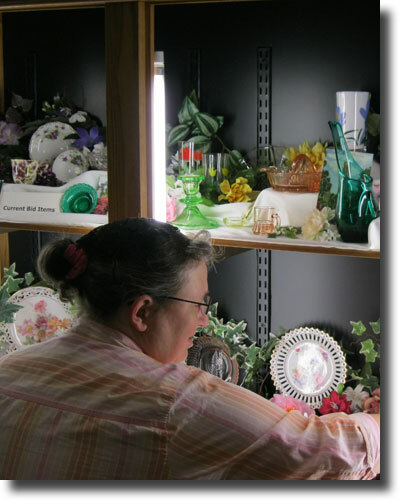 Volunteer Rita Richard spends countless hours researching and selecting each week’s items, then arranging them in the Silent Auction display case. We greatly appreciate all of the dedicated volunteers who give time to this worthy cause. The 2018 Heritage Day Silent Auction began its 14th season on Monday, October 16 and ended on Heritage Day, June 2, 2018. It was another successful year that generated over $5,700 in this year alone. Since its beginning 14 years ago, the Silent Auction has continued to generate interest and enthusiasm in participants. Not only does the Silent Auction provide an enjoyable experience, but it presents an opportunity to support a worthy cause. Proceeds are designated for the Sharing Fund, which helps to cover the cost of care for residents who have exhausted their financial resources through no fault of their own. Over the years the Silent Auction has raised almost $117,000 for this cause. Click here for more information on Heritage Day, June 2, 2018.